This one literally dropped in my lap… and a year later… gaaaaawn. As I’ve mentioned, I grew up in a country town called Griffith, which is inland and stuck between some dirt, some grapes and a lot more grapes. It’s famous for some things that a town really doesn’t want to be famous for. Griffith liked to have mini festivals, fetes, parties etc to drum up business for the local shops. One such event was the ‘Top Block Shopper’ promotion. The top block was the block of shops at the top of the main street. One year they decided to get together and run a competition where shoppers received an entry form for every item they bought in the shops. The shops then piled all the entries into a barrel and the winner won part of $2,000 worth of vouchers to be used at any of the participating stores. As it happened, my mates guitar shop ‘Custom Music’ was in the top block. I bought strings (and a lot of guitars) there all the time so I filled in a few entry forms, not expecting much. The draw was on Saturday, so I got into my car and drove to the Top Block, vainly looking for a car park. I spotted an empty car park… but someone who had driven past was about to back into it!!! A zipped in behind him and snaked his spot. To say he wasn’t happy was an understatement. He rolled his window down and started screaming obscenities at me. Man he was pissed. I rolled up my windows, locked my doors and patiently waited for him to piss off. Which he eventually did. I ran to the barrel guy before he drew out another ticket. You could hear 1,000 people groan, followed by the crumpling of a thousand losing tickets. I was ushered into the nearby motorcycle store and handed a huge wad of vouchers, which apparently were to be spent in various stores in the top block. I thanked them, grabbed the tickets and walked next door into my friends guitar shop. I handed him the winning tickets and pointed to a red Peavey hanging on the wall that I’d had my eye on. 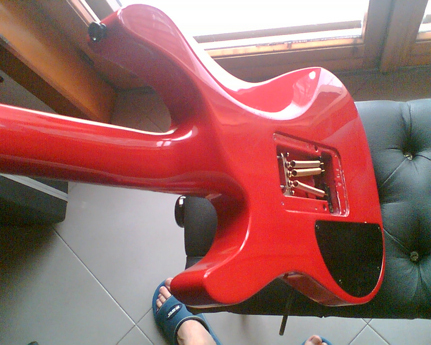 And the headstock… the work that went into it was amazing. It was a piece of sculpture. 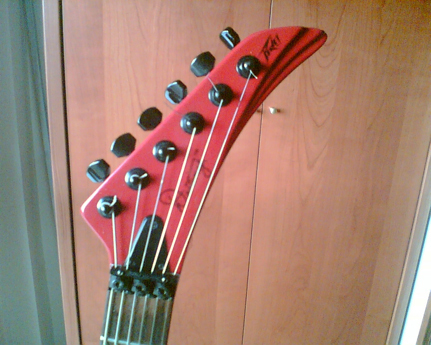 Like a Kramer hockey stick headstock, but in 3D. I loved this guitar. It actually made me a better player. I know people say that… but I mean it. I could play things on this guitar that I couldn’t on others. I remember being on stage at a metal show and ripping into a lead that was far beyond anything that I could play at that point. My hand and brain had a direct connection, and I was watching it going…”What. The. Hell?” Afterwards, the guitarist from the band we were supporting congratulated me on the show. I think he was a little surprised. I know I was. So, you know how this story ends. 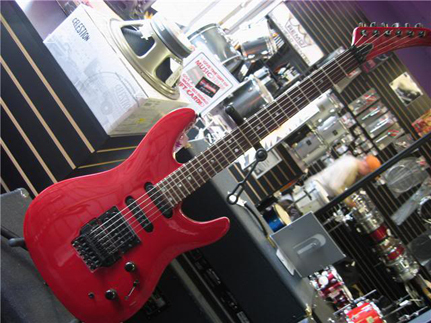 By then I was a huge Randy Rhoads fan, so I traded in the Peavey and bought a japanese Jackson Randy Rhoads Professional. 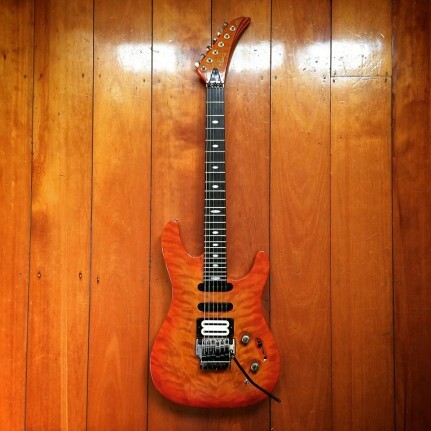 Another beautiful guitar… but honestly not a patch on the Peavey. I see these are about $300 now on eBay… a lot less than the $2,000 I paid! 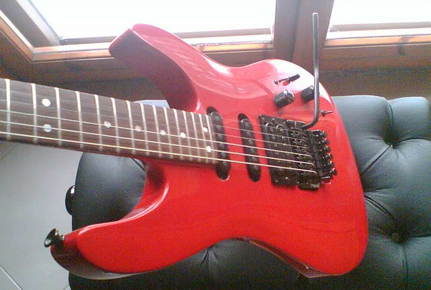 I’m actually thinking of tracking a red one down and seeing if this guitar is as good as I remember it was. Well, as I turned 40 this year I decided to buy a guitar that I’ve wanted for over 20 years. Yep, I tracked down a Peavey Destiny. They’re very hard to find in Australia… and especially the Custom which is what I’ve scored here. I’m so stoked about this guitar. It’s as good as I remember. The neck is slim and a breeze to play. 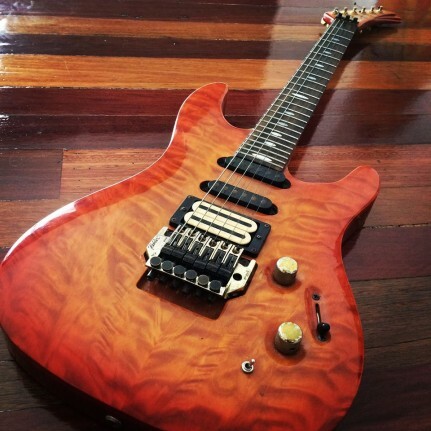 The Dimarzio humbucker is a little hot for my tastes so might be swapped out at a later stage. For the mean while though this is my ‘sit on the couch and shred with my headphone amp’ guitar. Hey Tony, You should write a book! I will buy it. Hello. I was wondering if you’ve managed to find another Destiny. Been looking for one too! No luck. Cheers.